Each month you will receive a pin that will be limited edition!~ The pin designs will be a mix of original art and fan art. Each pin will be hard enamel, unless otherwise stated with two pin posts and rubber backings. The size of each pin will range from 1 inch to 1.5 inches. Future designs will not be revealed, if you are a member and would like to see it, I can show you. But to keep it a surprise for members who like surprises I ask that you not spread the designs publicly. I also like goodies to go along with each pin, so there will be stretch goals for extra goodies. ♥If we get 50 patrons then each month along with the limited edition pin will be a 2x2 inch sticker. ♥If we get 100 patrons then each month along with the limited edition pin & sticker will be a Lanyard or 4x6 Mini Print. 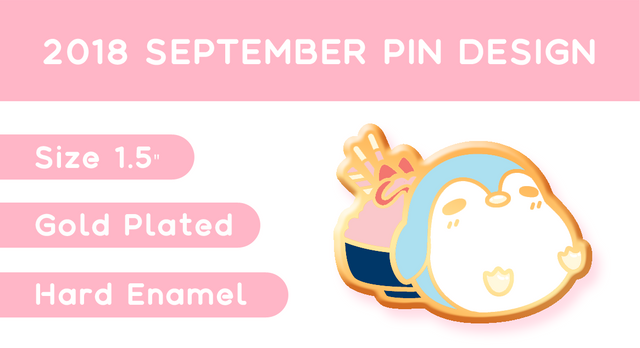 There are two tiers available for the monthly pin club! one for US residents and one for International residents and the shipping is included in both tiers. They will be shipped via First Class Mail with a Tracking Number. If you would like to purchase a full years worth of pins and wait for them all to be done instead of being shipped monthly then select the $10 Full Year spot tier. When the 12 designs are done, you will be contacted for your shipping info and billed for the shipping. US Residents will pay $15 and International will pay $35. Keep in mind if you join in September you will be getting September's pin design, which would be delivered at the end of September or the beginning of the next month. I won't have set dates for when packages go out but updates will always be posted when all packages have been shipped out and you will receive a tracking number. Want to cancel your subscription? Don't worry Patreon collects your money on the 1st of each month, so may cancel your subscription anytime before then. If you selected the $10 Full Year spot tier, then when you cancel you will get however many months you were subscribed for of pins and charged for the shipping. For example if you paid for 3 months of the $10 Full Year spot then you would be charged only $5 shipping ( shipping cost would depend on weight ) and receive the 3 pin designs. This spot is for those who would like to wait for the first 12 designs to be complete to save on shipping, instead of getting them shipped out each month. PLEASE NOTE: The shipping is not included in this pledge price, this is the price for the pin only. Once the 12 designs are done, I will contact you for your shipping information and I will send you an invoice for the shipping. US shipping will be shipped in a Flat Rate Box for $15 and International shipping will be shipped First Class for $35. Monthly Pin Club - International Res. ♥If we get 100 patrons then each month along with the limited edition pin & vinyl sticker will be a Lanyard or Mini Print.